With company representatives, Columbus Mayor Andrew J. Ginther, Council President Zach Klein, Delaware County Commissioner Gary Merrell, local officials and community leaders on-hand, IKEA, the world’s leading home furnishings retailer, today officially broke ground on its future Columbus store. Until the future IKEA Columbus opens in Summer 2017 as the second IKEA store in Ohio, customers can shop at stores in: West Chester, OH; Pittsburgh, PA; and Canton, MI; or online at IKEA-USA.com. The 355,000-square-foot future IKEA Columbus and its 1,100 parking spaces will be built on 33 acres at the northeastern corner of Interstate-71 and Gemini Place in the Polaris Centers of Commerce development, approximately 15 miles north of downtown Columbus. IKEA has contracted with Pepper Construction to build the project and plans reflect the same unique architectural design for which IKEA stores are known worldwide. IKEA also will evaluate potential on-site power generation to complement its current U.S. renewable energy presence at nearly 90% of its U.S. locations. IKEA Columbus will feature nearly 10,000 exclusively designed items, 50 inspirational room-settings, three model home interiors, a supervised children’s play area, and a 450-seat restaurant serving Swedish specialties such as meatballs with lingonberries and salmon plates, as well as American dishes. Other family-friendly features include a ‘Children’s IKEA’ area in the Showroom, baby care rooms, play areas throughout the store, and preferred parking. In addition to the more than 500 jobs that are expected to be created during the construction phase, approximately 300 coworkers will join the IKEA family when the new store opens. IKEA Columbus also will provide significant annual property and sales tax revenue for local governments and schools. Candidates interested in working at this employer of choice should begin looking online this Fall at IKEA-USA.com, where they can apply for diverse positions available in home furnishings sales, interior decoration, customer service, safety and security, cashiers, maintenance, goods flow, receiving, warehouse and stock replenishment. 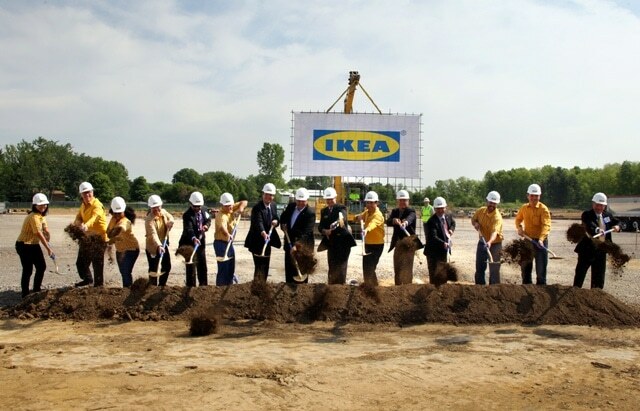 Among its total coworkers, IKEA Columbus also will offer more than 50 food service opportunities in its Restaurant, Swedish Foodmarket, Café Bistro and coworker cafeteria.